Aikman's defense of Mike McCarthy was that very frequently, teams "regret chasing points." He is saying that people always remember when a two-point conversion fails and the team ends up losing in a close one because of it - this is a pretty large bias. League-wide, two-point attempts convert around 48%. The break-even point to go for it was around a 30% conversion rate for McCarthy. This is not a huge swing, so little probability shifts here and there can definitely effect the decision. These numbers include team strength as well. That being said, McCarthy potentially sacrificed 2.0% in win probability by kicking the extra point. The Packers would ultimately score again and miss the no-brainer two-point conversion, leading 26-21. The next decision came on 4th-and-2 from the Green Bay 32-yard line - on the very play that Dez Bryant's catch was eventually overturned. Aikman strongly disagreed with the decision to go for it, down five, with 4:42 left in the fourth quarter. The Cowboys did have two timeouts remaining, but a 50-yard field goal attempt converts league-wide at 69.4%. The conditions for field goal kicking were also subpar, but the Cowboys have one of the best kickers in history in Dan Bailey (although he already missed one field goal during the game). So, let's say those two factors cancel out and the 69.4% is accurate for our baseline analysis. Before the play, the Cowboys had a 30.7% chance to win the game. A successful conversion means 50.0% win probability. Failure means 18.6% win probability. A missed field goal is essentially the same as the Packers would be looking to run the clock out. 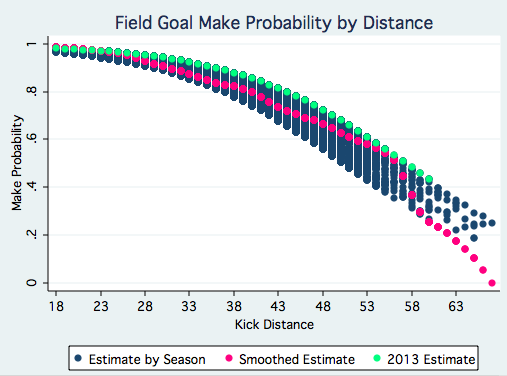 A successful field goal would mean a 28.2% chance to win for Dallas - and they would have a decision about whether or not to onside kick, but we assume they would not. A punt is also an option, which would result in an expected 20.1% win probability. E[WPGo-For-It] = 0.500 * 0.580 + (1 - 0.580) * 0.186 = 36.8%. The break-even point is 21.4% going for it, which means as long as the Cowboys think there is a better than one-in-five chance to convert, they should go for it (which they did). So, in both cases, based on the league-wide numbers, Aikman was incorrect - particularly in the case of going for it. Jason Garrett certainly made the right call - although the right play-call is a different story. While everyone is angry about the overturned call, keep in mind that the referee needed indisputable evidence to overturn the call. It was then indisputably an incomplete pass. That being said, ever since the Calvin Johnson touchdown was overturned, there have been complaints about the rule itself. So complain to the NFL about the rule, but not the officiating. It is not the same as the previous week against the Lions where there was a judgement call and the flag was picked up. Keith Goldner is the Chief Analyst at numberFire.com - The leading fantasy sports analytics platform - and creator of Drive-By Football. Follow him on twitter @drivebyfootball or check out numberFire on Facebook.